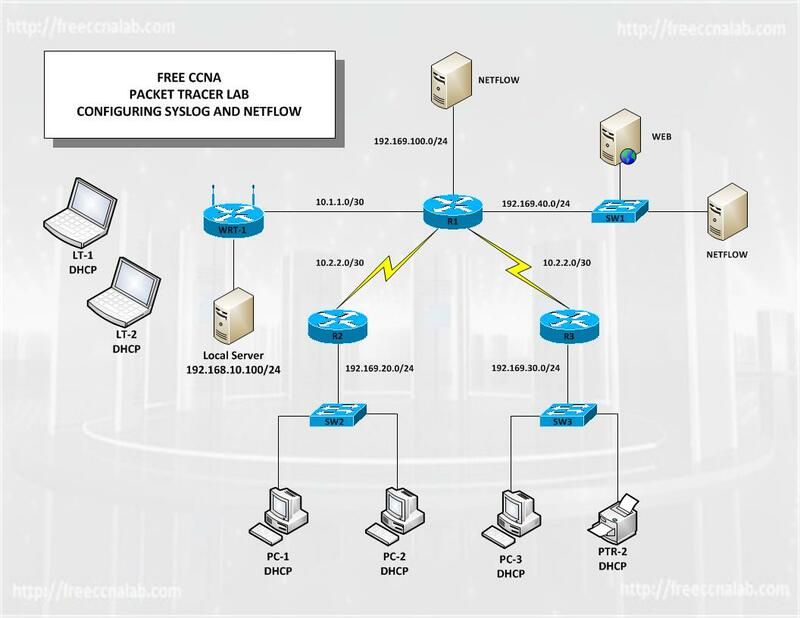 Several of the new CCNA curriculum requirements have adapted the new features in Packet Tracer 6.1. Among these new features is the NetFlow network protocol analyzer. This feature allows us to collect data statistics and analyze the network traffic. This is very useful when then troubleshooting problems, or design issues. The data collected from various devices using UDP protocol is sent to NetFlow and is commonly called the (collector). The data collected in various formats form these devices are then displayed in the form of tables and charts for analysis. The NetFlow has many version, the latest being version 9. NetFlow is a Cisco Propietary IOS application for collecting network IP traffic information. Simply said, Netflow provides detailed information on packets flowing through the network. Enabling NetFlow technology on the network helps creates an environment in which you have the tools to understand how network traffic is flowing. Netflow can be likened to an itemized phone bill that shows all the numbers the user called, how frequently, time, duration etc. Displays details of who uses network resources. Information can be used by business enterprises for accounting and charges for resource utilization. Detailed information can be used to do effective network planning. Information collected and analyzed can be used to customize network applications and services. This is used for collecting data flow on the network. This provides you with detailed, forensic-level information on top users on the network, data collected are usually preserved over time, you will be able to analyze network usage trends. This tool enables you to analyze the traffic on your network by showing the users, protocols, and more. With netflow analyzer, you can view the types of traffic (web, mail, FTP, peer-to-peer, and so on) that are on the network; also which devices are using most of the traffic. Network devices that are configured for NetFlow. Netflow Network components or devices collect IP traffic information on interfaces where NetFlow is configured. Network devices then export this information as NetFlow records to a central server that runs NetFlow Collector software, which also performs traffic analysis. Information captured and exported by NetFlow is done independently on each internetworking device or component. NetFlow does not need to be configured on each router in the network. In this lab we will use Cisco’s Packet Tracer to configure a small network consisting of few different devices. We will use this topology to demonstrate how to configure to configure NetFlow version 9 on a Cisco IOS. Configuring the protocol is relatively simple. First it is necessary to insure the Cisco Express Forwarding (CEF) is enabled, this is the default on most new cisco devices, but you should check if it is on the device you are using. The Traffic can now be displayed on the selected computer using the NetFlow appliclation. I have tested this and have no problem. Please provide more information. Hello, In order to download packet tracer 6.1, can we make a donation to get permission to download? You need to register as a user.